The weekend of 11 and 12 June this year will be long remembered by several dozens of students from Warsaw middle and high schools. It is all thanks to lasers, syntheses and Newton’s rings. The Adamed Group Foundation provided the participants with a range of physical experiments during the workshop organised as part of the ADAMED SmartUP Academy. The two-day course was dominated by what students like the most – that is experiments. 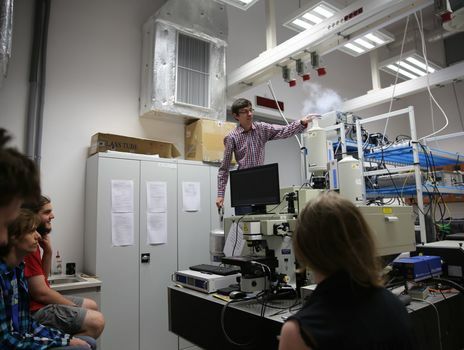 The young participants, together with their instructors, dealt with diffraction and interference of laser light, explored the light emission of matter and also learnt how to determine age using radioactive methods. The analysis of the Raman effect and luminescence, that is “laser jewellery verification”, aroused great interest. A part of the classes was devoted to the design and characteristics of optical systems, synthesis of super-heavy elements and Newton’s rings, which provide information on the optical system. The ADAMED SmartUP Academy is a programme of free-of-charge courses intended for young science enthusiasts. The workshops, designed for young people aged 15-19, are organised regularly in larger Polish cities. Meetings held as part of the ADAMED SmartUP Academy give their participants an opportunity to participate in discussions with experts, as well as exchange experiences and observations with their peers.